Despite challenges, oppression and the ever-present threat of attacks, Egypt’s Christians have a vibrant faith. When I visited the country, I walked through the burnt out rubble of St George’s Coptic Catholic Cathedral, Luxor which a mysterious fire completely destroyed. Yet, despite the devastation, more than 1,000 people pack into the hall and dusty courtyard every Sunday to celebrate the ancient Coptic Liturgy. I also visited a church which for 25 years has not been able to have a roof put on. 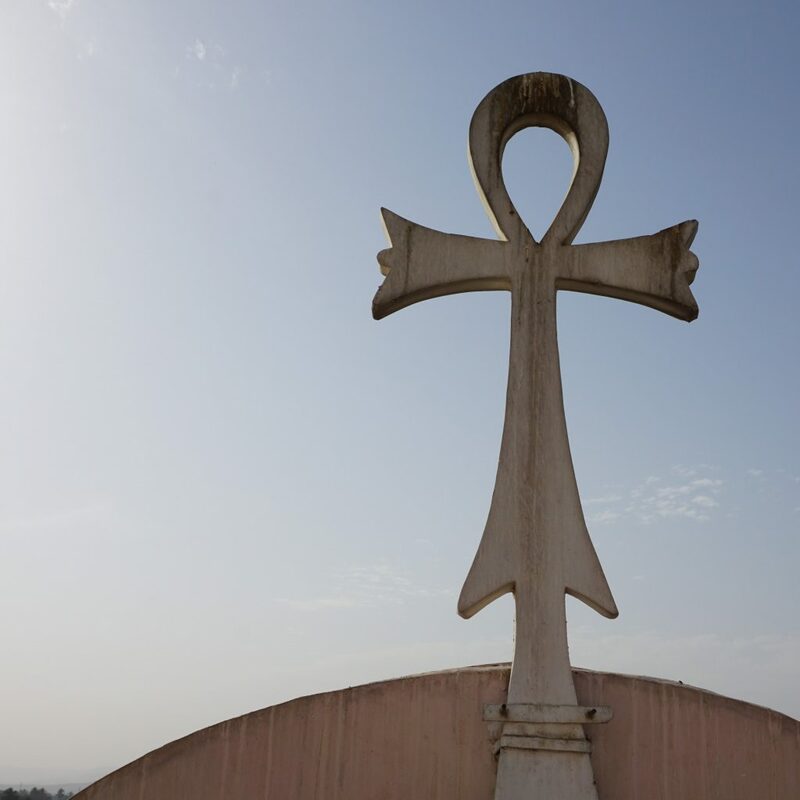 Shots were fired when they last tried to roof the Coptic Catholic Church in Hezaga, near Luxor – yet nearly 300 people squeeze into the half-built church every Sunday. The threats have not gone away, but the faith is thriving. In St George’s Church, El Izziyah I came away with a headache what with the noise of the children and the loud singing, after 51 baptisms were carried out over the course of three and half hours in a packed church. It was extraordinary, and demonstrated Egypt’s vibrant faith! Inside you will read about how, through your solidarity for your suffering brothers and sisters, we are helping to rebuild churches that have been destroyed by fire – as many churches were firebombed by extremists – as well as protecting churches from attack by supplying metal fences to guard against bomb blasts. As priests minister to their flock in a difficult situation we are supporting them with Mass stipends – and we are also supporting seminarians, many of whom I spoke to on my visit. 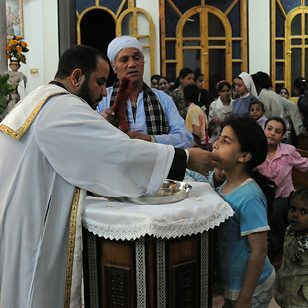 In Egypt, the Christian faith is very much alive, despite the trials and tribulations they are facing. It is thanks to your love that we have been able to help them. May God bless you. I met Bishop Emmanuel in the torched shell of St George’s Coptic Catholic Cathedral. In the embers and dust of the burnt church we knelt down and prayed. Bishop Emmanuel said: “We pray that out of the fire comes hope – and Resurrection Faith.” The fire, which broke out on the night of 20th April 2016, is still a mystery. Without investigating, authorities blamed it on “an electrical fault”. But many in the Church suspect that it was not an accident. Looking round, I was reminded of how small the 150-year-old cathedral was, tucked away in a narrow street with awkward access. The whole structure is dangerous and needs to be pulled down. On a nearby site stands an old catechetical centre in spacious grounds which has beendisused for years – Bishop Emmanuel showed me the centre and shared his plans for the future. People can get to the site of the old catechetical centre easily and there is parking on the street, so this is where he plans to build his new cathedral: “I feel God has directed me to this place.” Despite many challenges, in November 2017 they received approval to build the cathedral. This will have the capacity for 1,000 people and new pastoral facilities on the site. Once the architectural drawings are approved the bishop wants to start work immediately. The Bishop explained that he would not have got this far without the help of ACN. We have already provided £87,500 (€100,000) for the project – a small but important step towards completion. Bishop Emmanuel said: “The burning of the old Cathedral church wounded the hearts of the faithful… We need a lot of prayer as the strongest foundation for all that we have to do!” Please pray for Egypt’s Christians. Despite the bombings that rocked St Mary’s last year, its 2,000 parishioners have been resilient. Fr Kerolos has been parish priest here for 14 years and is very active. In the wake of the violence they have installed a metal detector – which the government insists that all churches in Cairo have – and they are putting up a metal fence to protect against possible bomb blasts. ACN previously gave them £17,500 (€20,000) to help them repair and rebuild, including the parish rooms which hold a nursery school for 280 children – both Orthodox and Catholic. These were a hive of activity. The teachers are enthusiastic but many of the children look hungry and poor. Four times a year Fr Kerolos provides a large food basket for 50 poor families. 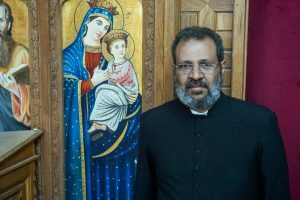 He tells me: “Help for the poor families is so important.” He adds: “It is good that we can share with the Coptic Orthodox – I met [Coptic Orthodox] Pope Tawadros last week when he visited – and we also reach out to the Muslims, who use the hall here for wedding and funeral feasts.” Thanks to your love, we have been able to help them. 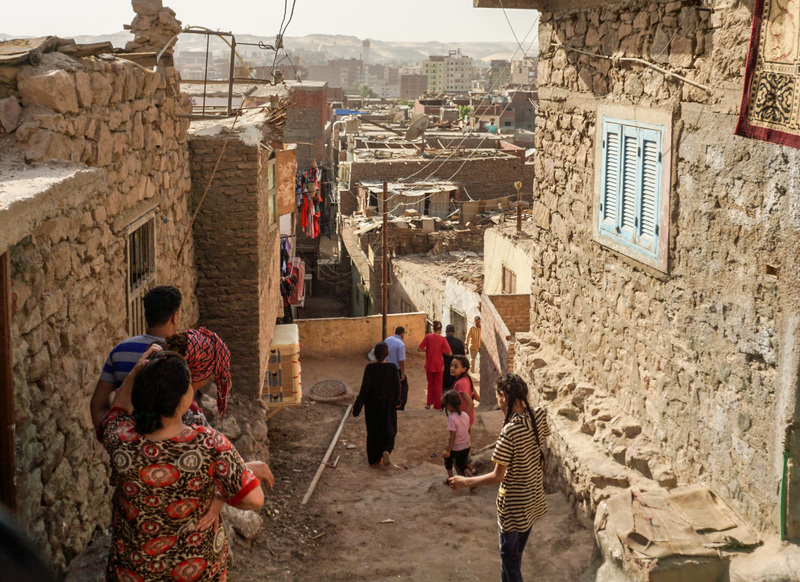 I accompanied Bishop Emmanuel on a moving visit to the stinking slums of Aswan. 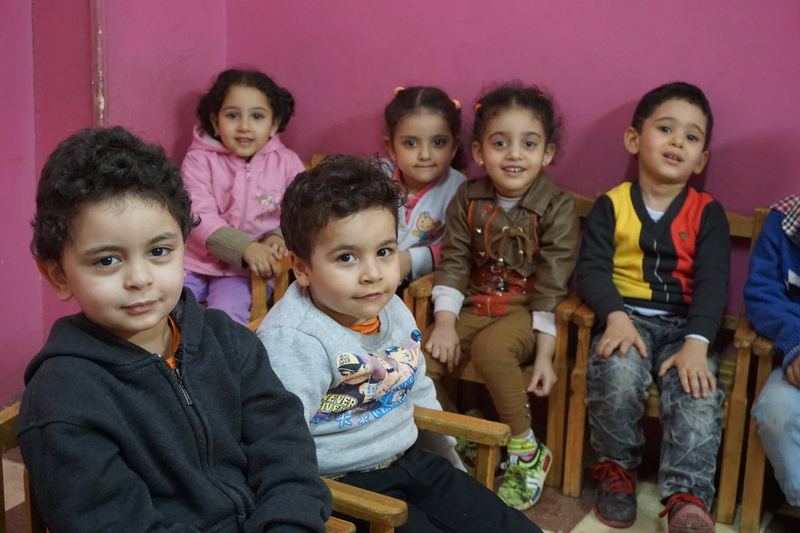 Along narrow streets and up ancient steps, we see the new Coptic Catholic clinic and centre which has just been opened – right in the heart of the poor families’ homes. Families beckon us in and in each of the tiny, dark, dank homes we visit, the bishop blesses the people and their homes with holy water and the love of Christ. God is close to these people – and brought closer by the pastoral work of Bishop Emmanuel. That could sum up ACN’s work here, bringing God close and enabling God to be close to His people, in faith, hope and love… as we keep the Faith alive in these biblical homelands. Deo Gratias. 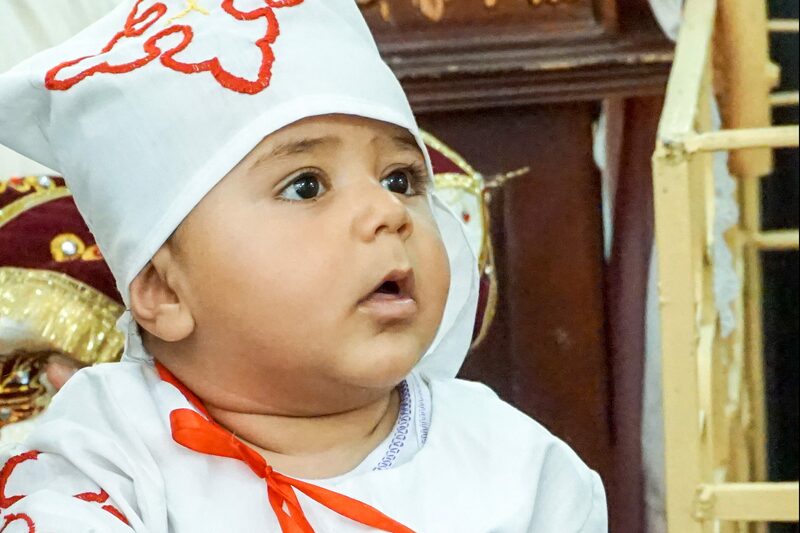 Through Mass stipends you are supporting pastoral work among Egypt’s Catholic community. During my visit to Egypt I was granted an audience with His Holiness, Pope Tawadros II, head of the Coptic Orthodox Church. He went on: “The meeting and visit of Pope Francis in April 2017 was of great importance. 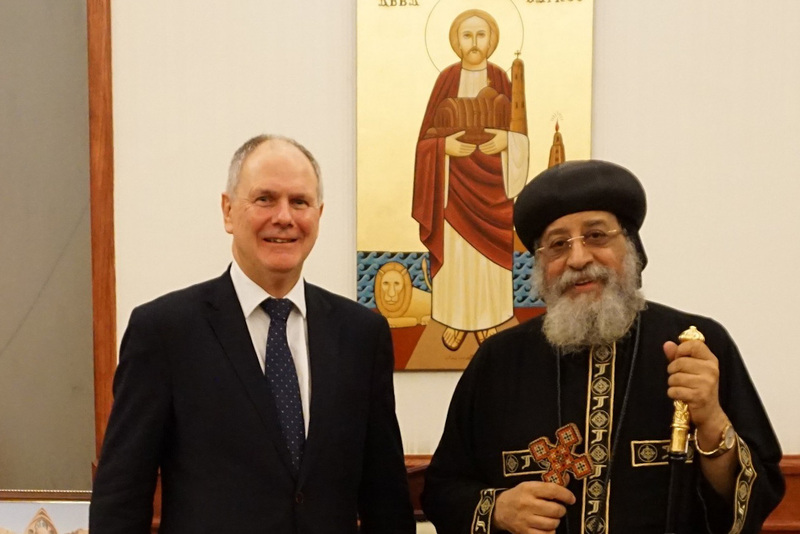 It was very good to pray together with the heads of the Churches in Egypt in the chapel of St Peter at St Mark’s Cathedral.” I also met with the Coptic Catholic Patriarch Ibrahim Sidrak who spoke about signs of hope. Thank you so much for all your kindness and prayers for our brothers and sisters in Egypt and the Middle East. Please be assured that you too will be remembered in our prayers. "Our lives are in God’s hands and we have our faith"